“When you enter through the portal, you may never return the same.” Savannah’s siren call echoes in your mind and body, a sinister syncopation matching the growing intensity of our truck’s windshield wipers. A veil of light rain announces, in crescendo, our approach to the point of no return: our Rubicon. The intensity of falling rain builds faster than our comfort zone permits, and the matching wipers’ sibilant sound, “sluuuck…sluuuck…sluuuck,” quickly changes to maximum motor speed, “lukluklukluklukluk.” Lightning bursts and wind-gusted sheets, draperies, and walls of water slow us to a 10 mph crawl. Shapes and emergency flashers blur past our windows like a movie seen through astigmatic lenses. The roar of rain hammering the thin metal skin of our vehicle is like standing behind a waterfall. The elements have seized control. We drive nearly blind, searching desperately for direction-reckoning landmarks to avoid catastrophe. Neck muscles connected to shoulder tendons strain to hold arms in precarious balance in the white-knuckled grip on our steering wheel. “Breathe!” is your mantra; “Luck!” as the windshield wipers seem to insist, is your mode of transport through this hopefully benign trial. Savannah has our attention as we emerge through the veil of grey into hazy slats of sun painting the prospect of a riverfront city frozen in time. Jane. The last we saw Jane, now our point of contact in Savannah, was fifteen years ago in the passenger departure lounge of the airport in Havana, Cuba. Little did we know it at the time, but our interminable hot, humid delay was but a decoy to give the baggage handlers time to break into our luggage and pilfer those electronics that were prized by the populace at the time—but that is another story. Jane was a member of our two-week educational Culture and Music Study Abroad Program in Cuba, offered through City College of San Francisco. She was a principal banner-carrier for significant socialization and partying during our stay, which was, to say the least, an attractive draw to us now as we entered this magical city. We anticipated tapping into the shared lifeline of juju that percolates and erupts uniquely from the crucible of Cuba. Something happens to a people suppressed and culturally compressed, and they—like we—found rhythmic outlet in sultry back rooms amidst the maze of dilapidated streets and buildings. We mamboed, cha-chaed, salsaed, tangoed, line danced, shimmied, drank, shouted, sang, and sweat until our clothes could no longer absorb the water from air or body, all to the music orchestrated from this genre’s master musicians…for us, in that magical moment! We walked into the Andaz Hotel in downtown Savannah and there was Jane, not leading a conga line as memory had it, but now behind the bar counter in the lobby lounge, orchestrating drink mix formulas like in a Hollywood horror laboratory. She instructed a young drink-mix-apprentice while simultaneously serving hotel hipsters with boozed bar banter, and experimenting with various concoctions. After a time of re-acquaintance she shouted, “It’s Fernet Branca time!” (Italian: alcoholic, herbal, aromatic, bitter) and mini-bottles emerged, held aloft, and a bar-wide salute ensued. Yep, this was our Jane. This moment can be likened to having a conversation, turning your head to speak to the person next to you, fifteen years morph pass, and you turn your head back and pick up where you left off. and in immediate proximity a sweep of the feet pushing aside vegetative detritus could reveal a curt snippet of recognition carved into a cracked concrete block. 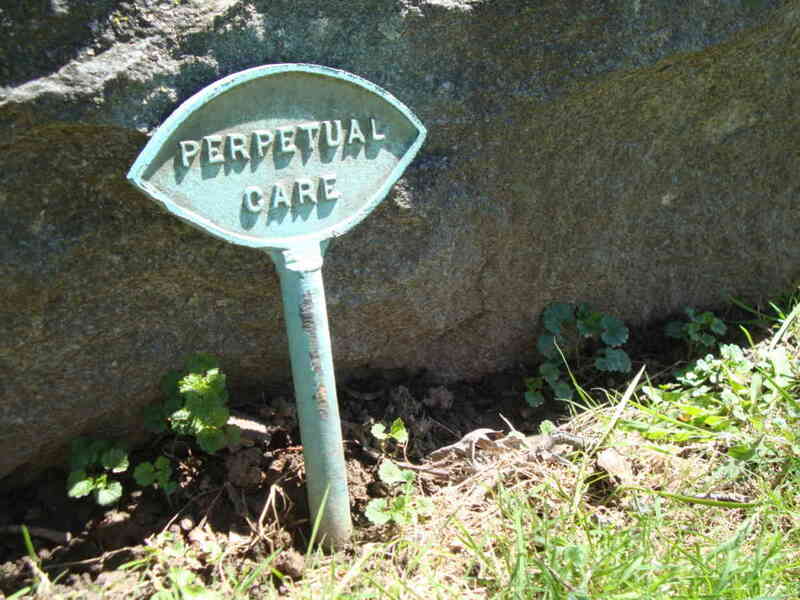 Many gravesites held brass plaques engraved with Perpetual Care. Others marked clearly, Do Not Service. This grand grave reminder of Death, celebrated in ages past and largely unspoken of today, comes to the fore as we perambulated, pondering our own destiny and mortality, very thankful and privileged to be here. 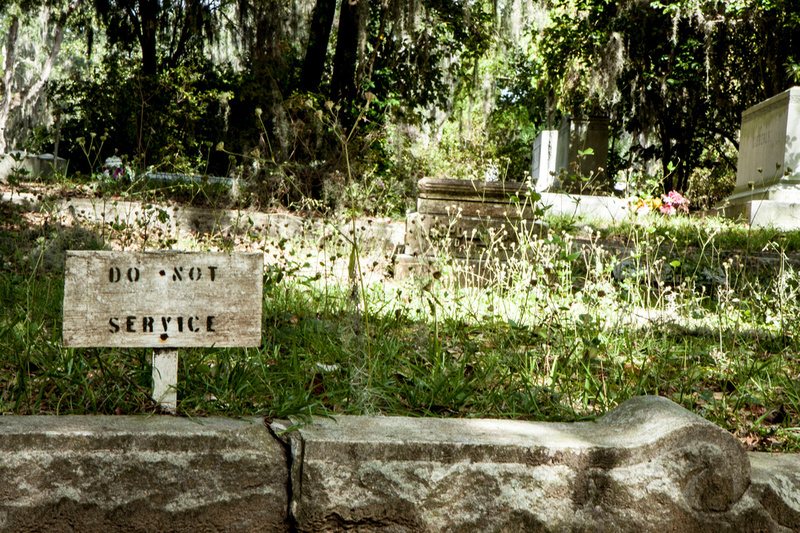 Another Savannahian gift from the past, into perpetuity. Touring the Town. “Now, ya’ll…I am not your regular driver, ya’ll, but will just take you to our depot and you will board the tram for your regular tour, but did ya’ll know that this highway was once the central car sales strip, ya’ll?” I glanced over at Ruth. She at me. She shakes her head almost imperceptibly, wordlessly warning me not to speak out loud. Our tour guide shuttle pick-up driver is loquacious in the southern extreme, aided by a microphone dialed up to 10—or is it 11? “Did ya’ll know that on Victory Drive—which we will be on shortly, ya’ll—there’s palm trees planted, one for each soldier killed in World War Two?” I couldn’t help myself, having done a wee bit of homework before hopping on board, and corrected her, “They were planted in World War One; and not one for each soldier killed, which would be huge, but just as a general commemoration.” The driver mumbled something into the mic, then said, “Yeah, World War Two, One, I get ’em mixed up, y’all.” She warbled on, and we prayed that this woman would not walk over and hop into our main tour vehicle, the classic “everytown tour USA” fake cable car on wheels, that ferried toad-like tourists blankly inattentive to driver drone. Our reprieve came, though, through the emergence of our actual tour driver, a middle-aged, white-haired Brit with typical dry English humor, backed with extremely prolific historical knowledge. We luxuriated next to the open windows and influx of rich Savannahian breezes over the next 90 minutes as we wound around most of the lush garden oases and key points of interest. There was, however, a bit too much pandering to the architecture and location Hollywood hounds seeking local references to the book and movie, Midnight in the Garden of Good and Evil. All told though, this was a wonderful adjunct to our hikes, explorations, research, and knowledge base of the area. cruising through forested lowlands, past the dark foreboding Savannah National Wildlife refuge, along a narrow two-lane highway passing intermittent bayou-esque shacks with rotten-toothed banjo players on front porches, to earn our destination. We murmured out loud, “Why the heck would anyone come way the hell out here to play music, and what sort of venue would host it?” Our answer materialized as we burst as though through a portal into a tony Mill Valley; a swanky, fashionable, colorless—dare I say it?—refuge of gentrification; this place exuded that sense of comfort, safety, and enlightenment that comes through encouraging arts in all genres. We searched valiantly for parking through the streets of town, passing one restaurant after another filled to bursting with well-heeled patrons. Families and chicly-dressed lovers holding hands promenaded through the well-trimmed central parkade. Music, laughter, and pleasant evening conversation filtered out from everywhere on a welcoming, cooling, and inviting breeze. A 24-mile drive on a suggestion and a whim began to grow on us, though still percolating. We quickly found ourselves at The Roasting Room’s upstairs entertainment space to catch Isaac Smith, the opening band with a refreshing country, folk, rock, roots, and Hawaiian mashup sound. We took our place next to Jane, who was offering test-drive sample drinks of Angel’s Envy rye whiskey along the back wall of the music venue that held, back lit through translucent glass, scores of diverse bottles of alcoholic pleasure. On our other side, we could see a face intently focusing on an iPod screen that controlled the venue lighting and sound balance. Next up, Matt’s band, Clouds and Satellites, played a rockin’ honky tonk, driving rock ‘n’ roll set that got everyone movin’ and groovin’. As it turns out, Matt is not only a connoisseur of sound but also, like Jane, of spirits of the liquid kind, and is the owner of the famous Original Pinkie Masters bar on the edge of the Savannah Historic District. We parleyed like pirates there one balmy night, listening to classic rock, house music, and joining the devoted and faithful locals in celebrating the only and best day of our lives. Too soon, the time to make the wee-hours, lonely, dark, and contemplative drive back to swaddling Savannah was upon us. We arrived in Bluffton with wonder, we left satiated and satisfied, another gift from this celebrated source of Southern civility. Leaving Savannah. Breaking free from the Spirit of Savannah was a hard undertaking. Her clutches encircled us like the covetous, insistent arms of an octopus. That same siren song we traveled toward not so long ago, through the rain driven portal, now was echoing in our minds, calling ever more insistently as we crossed a new veil of passage. But the song had changed. It wasn’t just a call but sympathetic harmony to a refrain emerging from us. Reaching again the apex of the bridge across the Savannah River, a glance into the rearview mirror revealed a ghostly, luminous wave of heat. A seeming mirage of water shimmered below it, the last vestiges of downtown Savannah buildings blinked for a moment above, and were gone…the long road stretched ahead. We smiled and hummed to ourselves. I enjoyed this second post about Savannah emensly. Makes me want to go back. Did you realize that your site settings require me to re-follow you each time I comment?